My parents were in town this week, visiting from the land of fire flies and the best fried catfish you can find- Alabama. Since my brother and I moved out here, they've been visiting a couple of times a year and it's become a regular activity to visits San Diego's Little Italy Farmers Market. If you live in the area and have never been, or you are planning on visiting San Diego, put this on your list of must-do's. This time around, we picked up a 7 pound Tahitian squash from one of my favorite booths- Schaner Farms. Some of the nicest people and best produce (and eggs). With so much squash on hand, I decided to take a twist on a traditional pumpkin pie, lighten it up a bit and add bit more fall flare with pink lady apples from another farmer's booth just down the street. I used a 12 in cast iron pan, but you can use a regular pie pan if you don't have one; however, you might end up with a bit of the filling left over. To begin, peel, core, quarter and thinly sliced your apples. Your slices should be about 1/8 in thick. Place in a small, shallow pan and cover with spiced rum. Set aside while you prep the rest of your pie. Be sure to stir your apples a couple of times to ensure they are all getting soaked in the rum. Roll out your chilled whole wheat pie crust in a circle until about 1/8 inch think, or until it’s large enough to slightly extend over the side of your pan (I chose a 10” cast iron skillet and it baked wonderfully). Place rolled dough in the pan, form to the sides and trim off excess, using the edge as a guide for your knife. In a food processor, place all ingredients for the Tahitian squash filling. Process until smooth (about 30 sec - 1 minute). Set aside. Drain the apples and add the remaining ingredients. Gently shake or toss until all slices are evenly coated. Pour squash filling into your pie crust. Begin placing apple slices in a circle, starting on the outer edge and working your way around and then into the middle (you can use the photo as a reference, but get creative and have fun, adding your own flair). 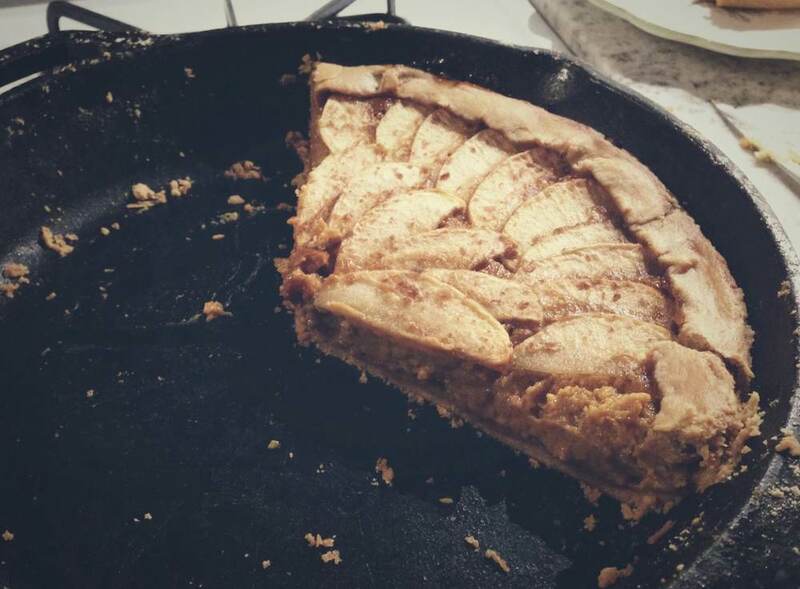 When finished, there should be about a ½ inch gap between the top of the apples to the edge of the pie crust. Gently fold the crust over the edge of the apples and tuck the edge back a little. Again, get creative! Place in the oven with a piece of foil laid on top. Bake for an hour and 15 minutes or until the center doesn’t giggle when you gently shake the pan. Let the pie cool for 45 minutes. Best served, slightly warm and with a cup of hot coffee or chai.